The classic tune rolls along in a sliding board book. 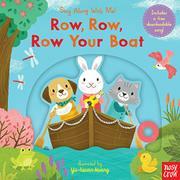 Sooner or later, just about every American child learns “Row, Row, Row Your Boat.” This large board book supplies little readers with four different verses, each set on a double-page spread. A dog, a cat, and a rabbit row their boat through the English countryside, a woodland, Antarctica (or maybe the Arctic—there’s a penguin standing outside an igloo, so it’s hard to tell), and a tropical rain forest. The illustrations feature rounded, smiling animals in warmly colored environments. The sliding components are easy for little readers to manipulate, but their construction leaves a bit to be desired; excitable little ones will have no trouble tearing them apart. A concurrently published title illustrates Twinkle, Twinkle, Little Star in a similar fashion. While not essential, these books do provide fodder for storytimes, and little ones familiar with how books work will be intrigued by the sliding panels.